Crayola Color Sticks look great on colored or white paper. Made of solid color so there’s no sharpening waste, they have an easy-to-hold pentagonal shape with five points for thin lines or writing, and five flat sides for broad strokes. 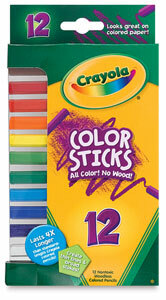 Color Sticks resist breakage and last four times longer than standard-length Crayola colored pencils. 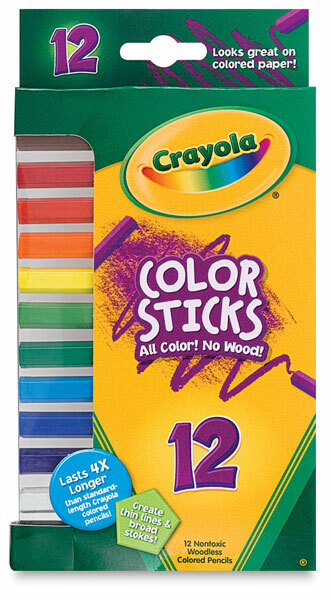 Classpack of 120 — This set contains 10 sticks in each of 12 colors, including Black, White, Violet, Blue, Sky Blue, Green, Yellow-Green, Yellow, Orange, Red-Orange, Red, and Brown. Set of 12 — This set contains 12 colors, including one each of Black, White, Violet, Blue, Sky Blue, Green, Yellow-Green, Yellow, Orange, Red-Orange, Red, and Brown. Set of 24 — This set includes Red, Red-Orange, Orange, Yellow, Yellow-Green, Green, Sky Blue, Blue, Violet, Brown, Black, White, Gray, Magenta, Pink, Light Blue, Aqua Green, Jade Green, Peach, Golden Yellow, Yellow-Orange, Mahogany, Tan, and Light Brown.